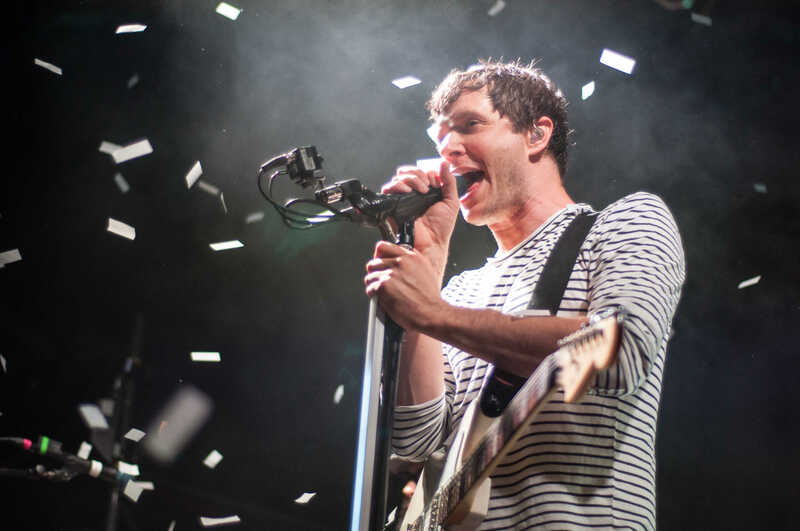 With glowing costumes and even more confetti, OK Go’s May 1 performance at the House of Blues dwarfed its Sun God Festival set. We interviewed bassist Tim Nordwind about the band’s ideas on giving a spectacular show. Photo by Taylor Sanderson for the Guardian. Any student who saw OK Go at Sun God Festival 2015 can attest to the band’s ability to put on a true show rather than just to go up on stage and play music. In fact, in the past few Sun God Festivals, it may have been the only group to know UCSD well enough to shout out on May 3 at RIMAC Field, “Hey, is this a nerd school? !” to which thousands of Tritons loudly cheered. But many students fairly unfamiliar with OK Go might not realize that its performance at the festival was merely a shadow of what the band is capable of putting on, like the headlining act at the House of Blues in downtown San Diego last Friday, May 1. To give an idea of the kind of show OK Go gave at the House of Blues, just understand that the confetti-and-graphics extravaganza at the Sun God Festival paled in comparison to what it did downtown. Band members danced around in suits with invisible ink that glowed phosphorescent under black lights. For one of the songs, they recorded the audience making noises and used it as the track. Bassist Tim Nordwind gave the band’s philosophy when planning out one of its spectacular shows. For one song, lead singer Damian Kulash got down from the stage and walked out into the audience with an acoustic guitar, got the whole audience to quiet down and played “Last Leaf” without a microphone. At that moment, even a lot of the grown men in the audience had a massive high school-esque crush on the guy. Though Nordwind expressed an interest in performing music from throughout OK Go’s career, he discussed the cause of the band’s stylistic shift between its second album (“Oh No”) and its third (“Of the Blue Colour of the Sky”). Despite this, Nordwind said that the band still does like to play songs off of the first two albums, back from the days where it sounds as if the band didn’t take or have quite as much creative freedom. In fact, “Get Over It,” which is exactly the kind of stadium anthem from its debut album that he was talking about, appeared in both the Sun God Festival and House of Blues sets, and the crowds went nuts for it — especially those at Sun God Festival 2015, since the band wisely decided not to show up in SDSU jackets.